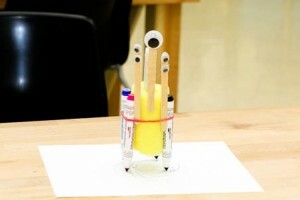 Using a few common, inexpensive items and an electronic toothbrush you can make a fun vibrating robot that makes unique art! 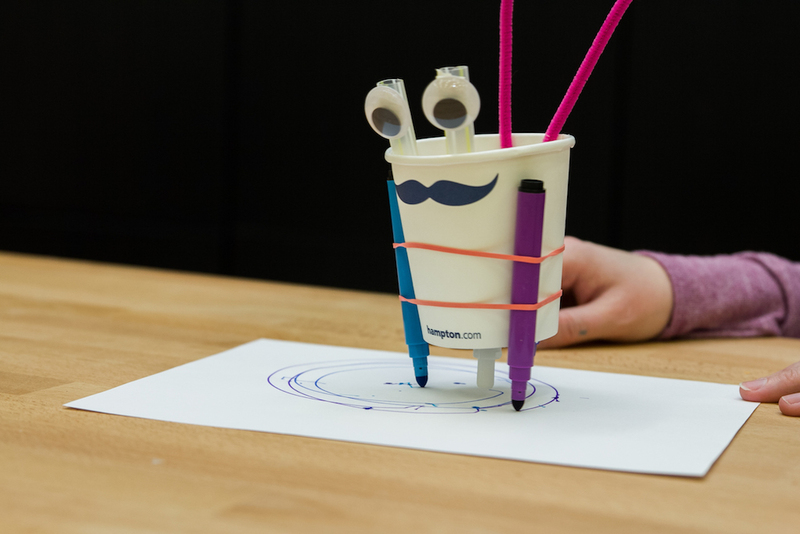 Art Bots are a fun and easy project for makers of all ages and skill levels to enjoy. 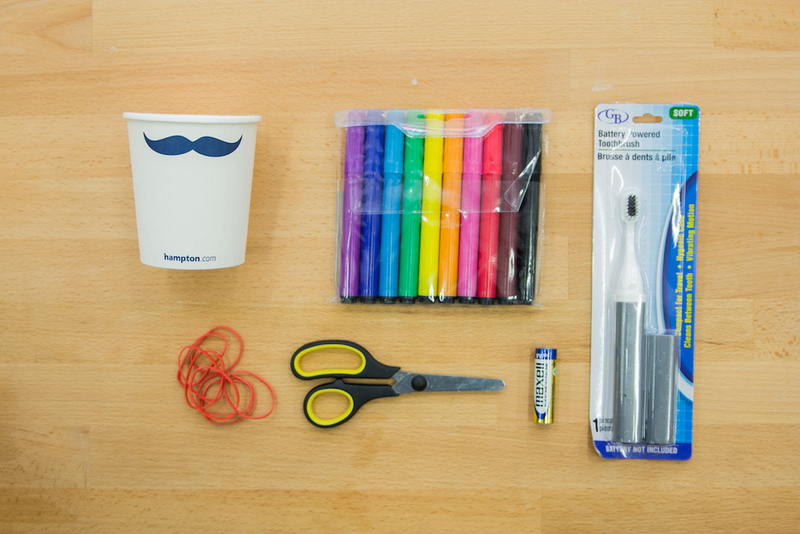 All you need are a few household objects, an inexpensive electric toothbrush, markers, and your imagination! 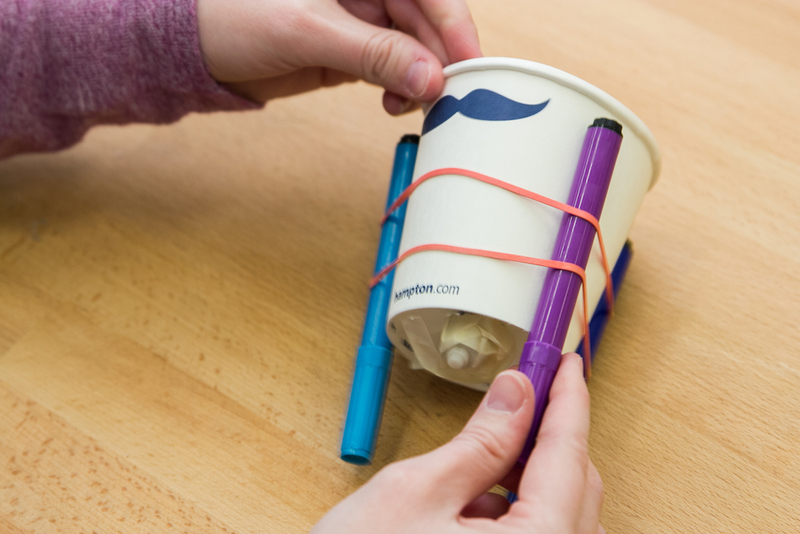 Building a simple housing for your electric toothbrush motor using paper cups or a section of pool noodle or other housing structure provides a vessel for your Art Bot that makes it mobile. The core supplies listed above are needed for every Art Bot, but the supplies listed below are just some of the common items we have used for decoration and style. You can mix and match to suit your preference and give your Art Bot character. For a workshop with 25 students you can expect to spend about $65 on supplies. 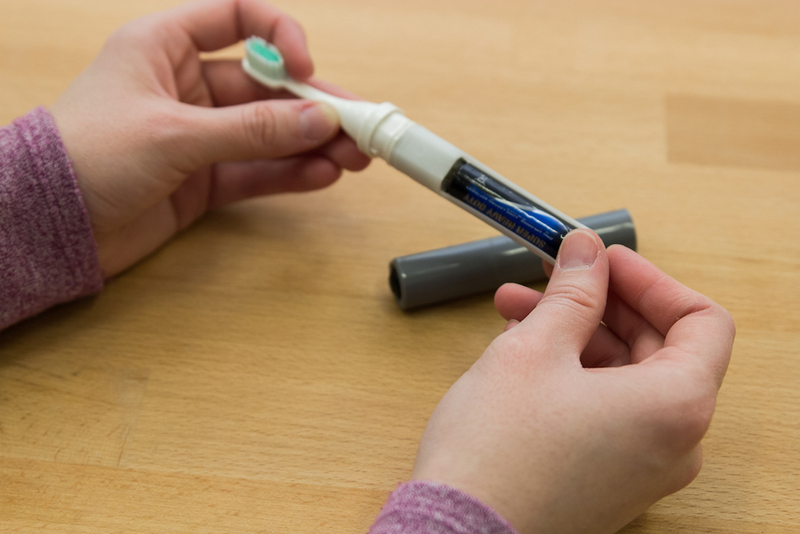 Place a battery in your toothbrush and make sure the motor works. These are cheap toothbrushes so quality control is not high on the list. You don’t want to get it put together to only find out your toothbrush doesn’t work! 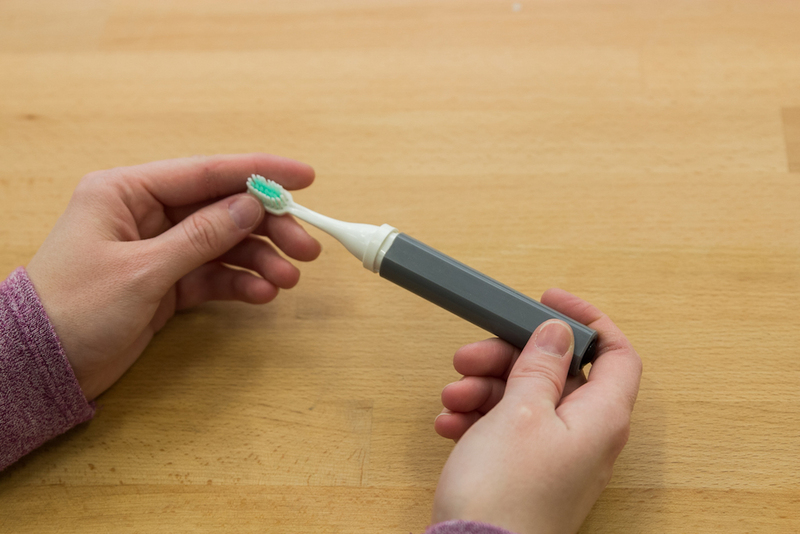 Depending on your vessel design, you may or may not want to reassemble your toothbrush. You may choose to leave the motor casing separate. If you are using a pool noodle for your Art Bot vessel, cut a section of your pool noodle that is approximately 4-5″ long. 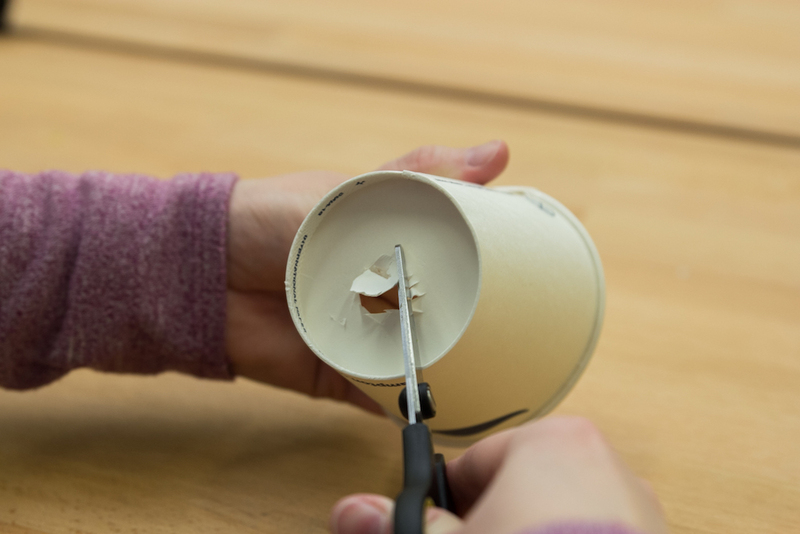 If you are using a paper cup for your Art Bot vessel, cut a hole in the bottom of the cup big enough to slide your toothbrush or motor casing through. If you are using a different item for your vessel, construct it any way you like! Insert your toothbrush or motor casing into the center of the pool noodle or the hole you cut in the paper cup. 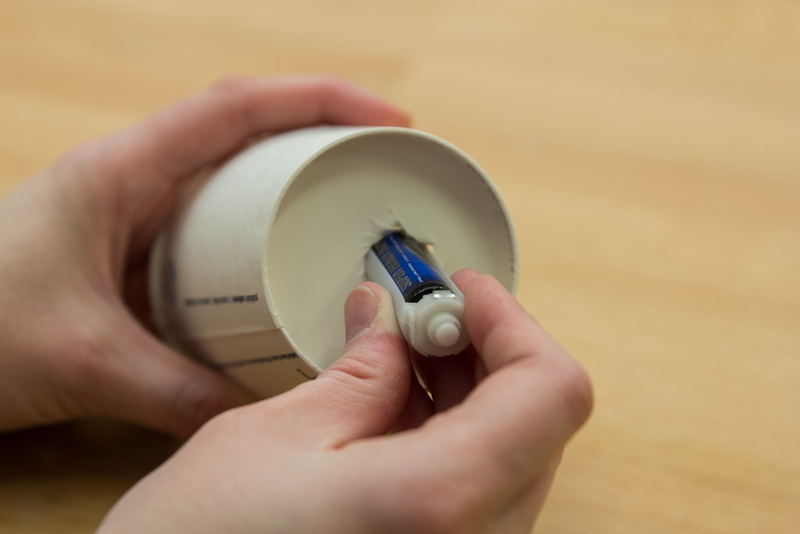 If you are using some other vessel materials, explore ways you can add your motor or toothbrush for effective movement of the housing. 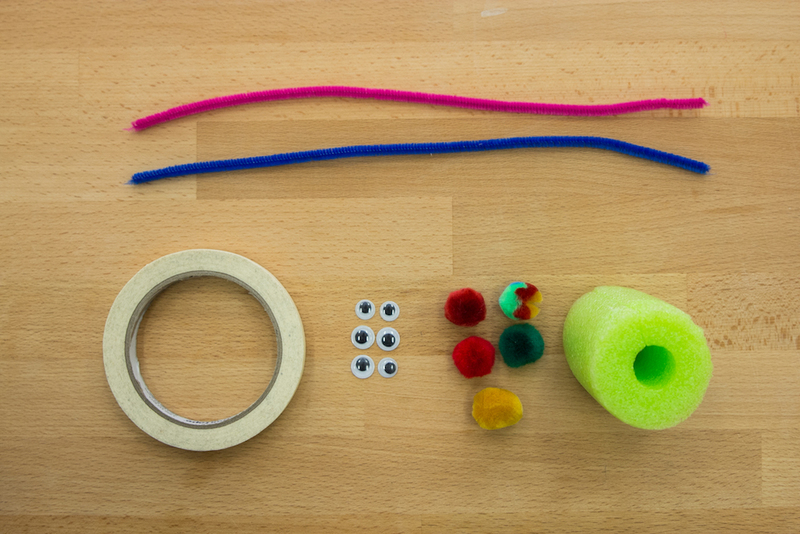 Using rubber bands or masking tape (or some other item) attach 3 or 4 markers to the outside of the pool noodle or paper cup. 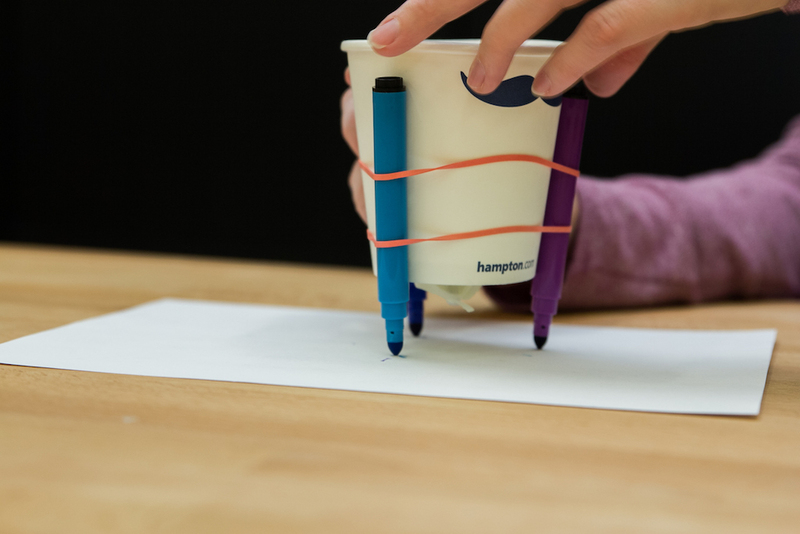 Again, if you have constructed a vessel using different materials, be creative in the way you attach your markers. Test fit all of your markers and Art Bot components to make sure that your markers are the only thing touching the surface. You do not want any of the parts to drag along with the markers, unless that is part of your intended design. 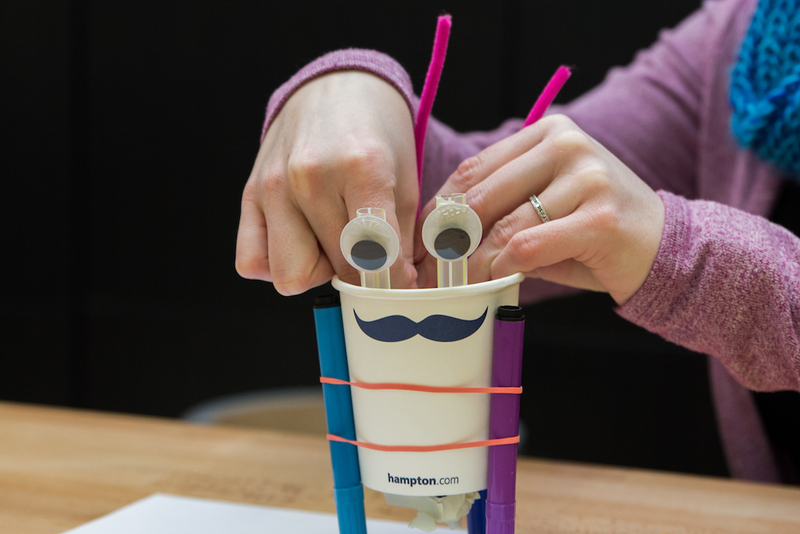 Using wiggly eyes, pipe cleaners, or other materials give your Art Bot some character! Each Art Bot is unique, so give your Art Bot the personality it deserves in this final step! Step 8: Turn on the motor and make art! Lay down a large piece of paper, turn on the motor, and watch it go! Your Art Bot will take off in ways you may not have expected, so watch in amazement and be prepared to catch it if it runs away! 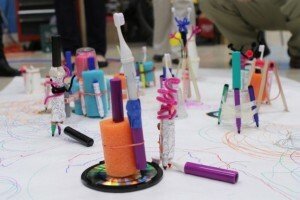 If you are making your Art Bots in a group, bring all the Art Bots together on a very large piece of paper on the floor to make an Art Bot Rally! This is our favorite part of making Art Bots because it is so fun to see everyone’s bots interact with each other and see the different type of art they make! DONE https://t.co/jKSuUDWQWa RT @artassignbot Make a sound collage with slits, due in 49 seconds. DONE! https://t.co/GXLt8vuAyk RT @artassignbot Make a sound installation about chips, due in 12 seconds. Build a website analyzing fear, due in 42 seconds. Create a piece about the exploitation of still life, due in 6 seconds. @artassignbot take 2 glasses, put poison in one, water in other, put in box, write on box: "jan 1st 2016, drink one of these"
@artassignbot gender is kinda like a durational performance anyways, right? @artassignbot They make you work yet, my silent avatar of self indulgence, and you will run around like my robotic clone daughter. @artassignbot I am, I'll let you know how it is.